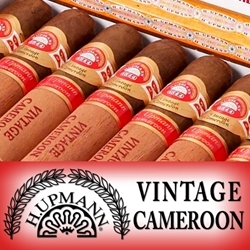 Created with the highest grade of African Cameroon wrappers, the H. Upmann Vintage Cameroon line features a Nicaraguan binder wrapped around an infusion of Dominican Republic, Nicaragua, and Peru fillers. These hand-rolled premium cigars offer every user an aromatic smoke with floral and fruity notes accompanied by sweet and subtle spices. It’s no wonder for the past 150 years, H. Upmann cigars have been highly respected among cigar connoisseurs. This premium handmade cigar really delivers a well-balanced, luxurious smoke with a wonderful aroma. Smokers Discounts can brings these elegant premium cigars right to your doorstep. We’ve made it easy and affordable to buy premium cigars online. A variety of sizes and flavors are listed below. Each of these styles are in stock and available today. Call us for more details!